Welcome to the Kennedy Grace Creations blog. Today I am featuring the newest clear stamp set - Sweet Baby Mine. To start off the card I heat embossed the star Hero Arts, star background stamp onto watercolor cardstock. I then used my Tim Holtx Distress Inks and ink blended a night sky background. I used Salty Ocean, Cracked Pistacio and Wilted Violet distress ink colors. I then die cut the banner frame die, which I purchased on Amazon. I cut it twice from thick Bristol cardstock, and adhered them together for a little dimension. I then adhered it to the background star panel I created behind the banner frame, and cut off the excess. 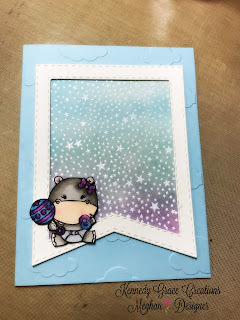 I then used a Darice cloud embossing folder on some light blue Bazzil Cardstock to make my card base. I added the star frame to the embossed card front. I then stamped the adorable Hippo from the Sweet Baby Mine clear stamp set. I colored her up with my Copic Markers and fussy cut her out. I then adhered this adorable Hippo to the bottom left side of the banner frame. I added some subtle sparkle details to the hippopotus' rattle, bow and diaper. Thank you for visiting the Kennedy Grace Creations blog.